The EMSB has produced a special election brochure. It is posted here on the EMSB website. Glossy copies will be printed and sent to the schools for students, staff and the public residing in the area. EMSB IN THE MEDIA: The EMSB would like to point readers to the media clippings section of our website where we provide links to newspaper articles about our Board or relevant to the local education system. You can watch them here. The EMSB posts links to television and radio reports, as well as videos produced in-house on our website. EMSB TV is hosted by Vimeo and we have sections for EMSB TV Coverage, EMSB Videos and others. Local media recount their first day of school. CTV AD CAMPAIGN: The EMSB’s unprecedented television advertising campaign on CTV for the high school sector has been running throughout the month of September and met with loud applause. Five commercials feature students grouped by schools: Royal West (Matthew Almengo-Raymond) and Vincent Massey (Beatrice Dupont);John Paul I (Jason Carnevale) Laurier Macdonald (Divya Aery) and Marymount Academy International (Alexandra Sarmiento); John F. Kennedy (Veronica Melo Martins) and Lester B. Pearson ( Justin Terassi); Rosemount (Vanessa Aparicio), FACE (Yocoyani Badillo-Amberg), James Lyng (Iyanla Simmons); Westmount (Tanjena Akhter), LaurenHill (Sarah Vacante) and Royal Vale (Joshua Adam Werber). You can see the commercials here. Host Dave Kaufman with Jason Carnevale and Divya Aery on the air. Divya Aery and Jason Carnevale, along with Principal Luigi Santamaria and teacher Stephanie Moro, were guests on the CJAD show The Exchange, with host Dave Kaufman, on September 18. They spoke about their own schools, the benefits of the International Baccalaureate Program and what it was like to record TV commercials. You can hear the broadcast on the same EMSB Radio link as above. EMSB BUDGET: The EMSB has adopted its 2014-2015 Operating, Capital Investment and Debt service budget for the 2014-2015 academic year. This budget reflects the $1.4 million deficit reflected in the three year equilibrium plan approved in December 2013, in addition to the $3.8 million in Ministry of Education, Leisure and Sports (MELS) budgetary compressions for 2014-2015. This $5.2 million deficit budget incorporates additional revenues from the Adult Education and Vocational Services (AEVS) sector, staffing reductions for a total of $800,000, and a decrease in enrolment of approximately 250 students. The budget is within the MELS authorized limits, but there is a requirement to deposit a new equilibrium plan which foresees a balanced budget by 2016-2017. This will be completed by December 2014. THE ICE BUCKET CHALLENGE: The 2014-2015 academic year began on September 2 at the EMSB with Chairman Angela Mancini and Vice-Chairman Sylvia Lo Bianco embracing the Ice Bucket Challenge at Roslyn Elementary School in Westmount. Not only did Ms. Mancini take the Ice Bucket Challenge at the school. She also introduced an educational program about ALS (amyotrophic lateral sclerosis), often referred to as "Lou Gehrig's Disease.” ALS is a progressive neurodegenerative disease that affects nerve cells in the brain and the spinal cord. Motor neurons reach from the brain to the spinal cord and from the spinal cord to the muscles throughout the body. Diane Tkalec, a spokesperson for the ALS Society of Quebec and a nurse by profession, spoke to students about the disease which took the life of her husband seven years ago. Teachers are being encouraged to download educational materials at http://sla-quebec.ca/support_and_services_youth.php for the classroom. Donations should be directed to http://sla-quebec.ca. Many schools have done their own Ice Bucket Challenges already, as did EMSB Director General Robert Stocker. Galileo Adult Education Centre raised $700 for the cause when Principal Martina Schiavone stepped up and accepted the challenge from Vice Chair and commissioner for Montreal North Sylvia Lo Bianco. Ms. Schiavone challenged her teachers and staff. Students and staff purchased raffle tickets and if their ticket was drawn they had the honor of dumping the bucket of water on our heads. You can see many of these challenges on EMSB TV. ALOUETTES GAMES: Tickets for two upcoming Montreal Alouettes games (October 13 and November 2) are available at the very special prices of $13, $15 and $20. One dollar from each ticket sold will go to Inspirations Newspaper while another dollar will be directed towards Roslyn Elementary School. Log on here. MOURNING THE LOSS OF A STUDENT: It is with a heavy heart that the EMSB community mourns the sudden passing of 14-year-old Brandy Gerro, a student at John Grant High School in Côte Saint-Luc. Brandy, the daughter of Keith Gerro and Alison McLean and sister to four siblings, passed away on August 27. She was a member of the EMSB family for a number of years. Following her graduation from Westmount Park Elementary School, Brandy enrolled at John Grant High School and studied there for the past two years. Due to Brandy’s sudden passing, donations to help ease the funeral costs will be greatly appreciated. Cheques can be written to The English Montreal School Board and sent to the attention of Margaret , John Grant High School, 5785 Parkhaven Avenue, Cote Saint-Luc, Quebec, H4W 1X8. The phone number for the school is 514-484-4161. EMSB UPDATE. COM: Besides the new www.emsbfocus.com, we have introduced a new blog at www.emsbupdate.com, which was used for the start of the academic year to report upon different media coverage. This will also contain breaking news, when necessary. New Principal Joe Schembri leads students. students were offered a tour of the school, had a meet and greet with the teachers and then enjoyed some yummy homemade goodies offered by the Parent Participation Organization. Parents were also given an idea of what a typical day of kindergarten looks like. So there are no more worries for students and/ or parents. MISSING LINDA: General Vanier dedicated their annual Welcome Back event to teacher Linda Di Sarro, who passed away recently. There was a ceremonial tree planting in her memory and a poem read as well. It was a great day for students and their families. their 80-year old auditorium. A goal of the foundation is to upgrade the facilities and develop it into a Performing Arts Centre for student and community use. Entrance was free of charge. Thanks to food and beverage partners, Aramark, Maple Leaf Foods, Canada Bread Company, Pizza Pizza and Brasserie McAuslan, a wide selection of food-for-purchase, including vegetarian, kosher and halal options, was available. In addition, there were six large inflatable games, in which a $10 ticket provided children and teenagers with unlimited access. Other entertainment included the Royal West Academy Honour Band, musical theatre as well as a demonstration of the school’s scientific prowess through various projects and including live 3D printing. NDG Liberal MNA and Minister of Immigration Kathleen Weil delivered remarks, following a cake cutting ceremony. EMSB officials and staff, including former administrators, admire the birthday cake. and began with a ribbon cutting at the main entrance via a live broadcast to 700 students in the auditorium. A second live broadcast took place at the Draper Avenue entrance, where a group of students unveiled a new mural, which was painted this past summer by students along with artist collective En Masse Pour Les Masses. Immediately following the assembly, all guests were invited to the schoolyard for a barbeque, which in addition to a wide range of food, featured inflatable games and live music. Royal Vale was originally established on Clanranald Avenue in Snowdon in 1918. It relocated to nearby Dupuis Avenue in 1953. Twenty-five years ago, in 1988, the school reinvented itself as an alternative French immersion school with a greater emphasis on math and science, as well as a Jewish Heritage program. The growth of the school quickly prompted it to move to its current location on Somerled Avenue in 1993 in the building once occupied by West Hill High School. By 1997, Royal Vale expanded to its current format: a Kindergarten through Grade 11 School, continuing as a French immersion school with a heavy emphasis on math and sciences. See these slideshow and promotional videos. HOUSE LEADERSHIP: On September 5, Rosemount High School held its annual Welcome Back BBQ, as well as its second edition of back-to-school House Games. The latter was implemented last school year, along with the inauguration of a House Leadership system. Before being treated to a delicious BBQ lunch, students from each House competed in mini-relay games to accumulate House points in their school-year-long quest for the House Cup. At the end of the day, Peterson House (named for musician Oscar Peterson) came out on top to start the school year. Peterson House is also the defending champion from last school year. The day was also an opportunity to put the 2014-15 House Leaders to the test, who came in to school in August for leadership training and planning sessions. The House Leadership system has been a success at Rosemount High. DUKE OF EDINBURGH AWARDS: This year, Rosemount High School is proud to offer the prestigious and world-renowned Duke of Edinburgh’s International Awards Program, the first and only school in the EMSB to do so. The Duke of Ed awards, founded in 1956 by HRH Prince Philip, is a self-development program for youth aged 14 to 24, and requires a minimum time commitment in four areas: community service, physical fitness, skill development, and an adventurous journey (overnight expedition). The time commitment depends on the award level chosen: bronze, silver, or gold. Throughout the year, the RHS Duke of Ed group will challenge themselves in these areas, but the activities undertaken for the award, which are proposed by the participants, are meant to reflect students’ passions and interests. Participants learn to set goals and achieve them in fun and challenging ways. More information about the program can be found at www.dukeofed.org. HAMPSTEAD PARADE: In honour of the Town of Hampstead’s 100th anniversary, a full day of free and fabulous events occurred on Sunday, September 21, starting with a parade along Queen Mary and Fleet, followed by a concert in Hampstead Park and musical fireworks. The parade featured over 60 groups representing more than 850 participants including 15 ethnic dance groups, antique, race, and exotic cars, salsa groups, bands, circus performers, celebrities, dignitaries, free giveaways and so much more. The children and staff from the EMSB’s Hampstead School participated in the parade, as well as, a steel drum band comprised of students from Coronation School. One of Hampstead School’s former graduates just happens to be Mayor William Steinberg. The opening ceremony starred Ginette Reno, accompanied by Guy Lafleur, wearing her Canadian’s hockey jersey and singing O Canada. EMSB Chair Angela Mancini, Vice- Chair Sylvia Lo Bianco and Commissioners Syd Wise, Marvin Helfenbaum and Ellie Israel represented the EMSB as well. SUNDAY BITE AT HAMPSTEAD: CTV’s recent Sunday Bite feature focused on Hampstead Elementary School to film their garden in the front yard, interviewing Principal Hilda Hacikyaner and green initiative advisor Marcus Lobb. The garden was a project launched last spring. CTV taped a session with eight students outside, in the garden and showed the process of drying seeds and using them for planting next spring. There was also a food preparation segment, where they made a Caprese salad with tomatoes and basil that they had picked from the garden. The focus of the segment was learning about FOOD from garden to table. Patrizia Tummillo and Ginette Sauvé-Frankel. Carl Andersen leads the walk. TERRY FOX RUN: In what has become an annual tradition, the streets of Westmount were flooded with all the students and staff from Westmount High School for the school’s third annual Terry Fox Walk. The walk is organized annually by Jeff Kosow and students from the school’s Leadership program. Serving as honorary chair of the walk was 77-year old Carl Andersen, an alumnus of Westmount High School from 1950-1952. Andersen, who lost his mother and both sisters to cancer, has raised an estimated $850,000 for cancer research since 1982. Over the course of his dedication to fighting the deadly disease, he has jogged nearly 100,000 miles. Andersen is poised to break that mark in 2014. Here is the video. extensively with inventory control, online sales and purchasing. He can be reached at gdemos@emsb.qc.ca... EMSB Pedagogical Services History consultant Tino Bordonaro has been appointed to Advisory Board on English Education by Minister of Education, Leisure and Sports (MELS) Yves Bolduc. The ABEC is mandated to advise the Minister on issues affecting education services at the elementary, secondary, adult and vocational levels. Mr. Bordonaro has been given a three year term. Cathrine Le Maistre, the former Associate Dean at the Faculty of Education at McGill University, is the chair of this body; Mr. Bordonaro began teaching Secondary Social Sciences in 1995 as well as McGill University. He assumed his present position at the EMSB in 2010. HOME AND SCHOOL ASSOCIATION CONFERENCE: The Quebec Federation of Home and School Associations will be holding its annual Fall Conference for Parents on Saturday, October 25 at the Pearson Electro-technology Center in Lachine. Parents and teachers are being encouraged to attend. The conference theme Brain Matters will be looking at Brain development and how it impacts our kids. This will be an excellent opportunity for parents to discover what is really going on in the heads of their children - what to expect and what not to expect. The QFHSA will also be hosting a panel discussion on School Board Elections as their contribution to encouraging voter participation on November 2. EMSB parents will have an opportunity to meet parents from other schools at the Regional Council meetings, enjoy a luncheon and participate in the panel discussion. The cost of attendance is $25 for H&S members and $35 for non-members. See the flyer. ST. GABE’S ON BREAKFAST TV: The first day of school was full of excitement for St. Gabriel Elementary School in Pointe St. Charles as City’s Breakfast Television broadcast a series of live reports. Host Wilder Weir interviewed Principal Jim Daskalakis, Commissioner Richard Lalonde, parent David Benoit and students. There were even some musical presentations. GENERATIONS BAGEL BREAKFAST: The Generations Foundation, which serves hot meals to students at many schools and arranges for summer camp experiences, held its annual Back to School Bagel-o-thon at St. Viateur Bagel Café in NDG on September 18. On September 10, City`s Breakfast Television broadcast from James Lyng High School (right) in St. Henri to report upon their association with the Generations Foundation. Adrian and Natalie Bercovici and EMSB students. Planting bulbs at Pierre Elliott Trudeau. INTERNATIONAL PEACE DAY: For international peace day (September 22, 2014) the students of Pierre Elliott School will be out planting bulbs in the flower beds that were donated by West Island Nursery. JUMP ROPE: Schools are being encouraged to participate in the annual Jump rope for heart program, offered to primary schools in Montreal. Supporting kids' health for more than 30 years, Heart and Stroke Jump Rope for Heart™ encourages kids to get active by skipping rope while they collect pledges for heart disease and stroke research. The program gives children the chance to jump and play alongside 750,000 other kids in more than 4,000 schools across Canada. 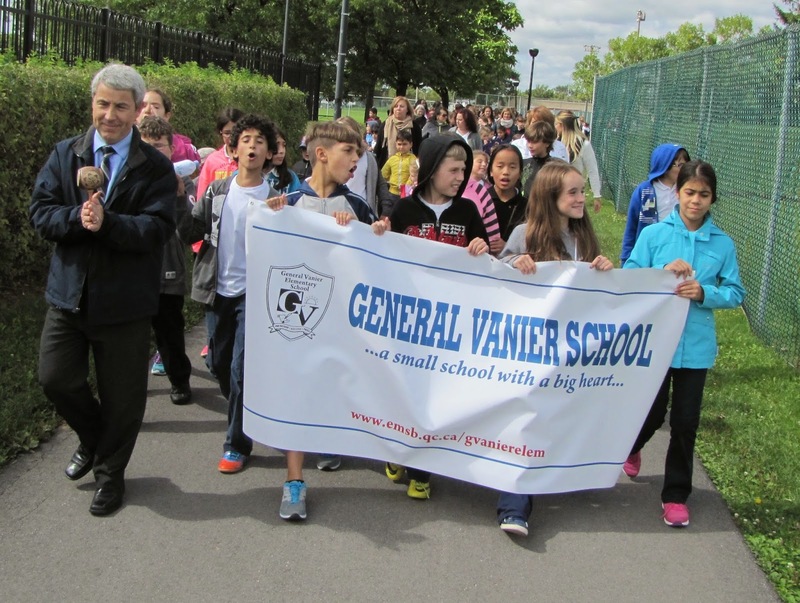 Over the years Royal Vale School in NDG, with physical education teacher Norman Katz leading the charge has run very successful events. Here is a poster whichdescribes the program. Here is the link to their new video as well. For more information contact Jessica Liberatore at 514 871 8038 #240 or email jessica.liberatore@fmcoeur.qc.ca and log on to fmcoeur.ca or heartandstroke.ca. SPORT-ÉTUDES AND THE IMPACT: Lester B. Pearson High School in Montreal North is very excited to continue its very successful partnership with the Montreal Impact Academy. This year nine students from the school’s successful Sport-Études program will take to the field for the Academy. They were in attendance at Saputo Stadium onSeptember 17 to cheer the Impact on in their CONCACAF (Confederation of North, Central American and Caribbean Association Football) Champions League match versus the New York Red Bulls, which they won 1-0. Here is a video. A typical day for the student athletes begins with classes at 8:05 am to 12:25 pm. Following lunch, the students have split training and academic study sessions at the Impact Academy from 1:15 pm until 4:30 pm. Training takes place at the Complexe Sportif Marie-Victorin, less than two kilometers away from Lester B. Pearson High School. The nine Impact Academy students are: Benjamin Collins and Sean Rea, Secondary I; Daniel Pacella and Tristan Resendes, Secondary III; Tristano Fasulo, Luca Piccioli and Marco Pinna Cavallini, Secondary IV; and Steven Alberici and Jackson Pickard, Secondary V.
Steven Alberici, Luca Piccioli, Impact Technical Director Matt Jordan, Jackson Pickard,Marco Pinna Cavallini, Nicolas Coupleux, Casey Gagné and Safa Ziga. As the only EMSB high school to feature a Sport-Études program and to serve as a partner with the Montreal Impact Academy, Lester B. Pearson places an equal emphasis on pursuing one’s education and athletic passion. A typical day for the student athletes begins with classes at 8:05 am to 12:25 pm. Following lunch, the students have split training and academic study sessions at the Impact Academy from 1:15 pm until 4:30 pm. Training takes place at the Complexe Sportif Marie-Victorin, less than two kilometers away from Lester B. Pearson High School. For more information on Sport-Études program, Lester B. Pearson High School is holding an open house on October 7 from 7 p.m. to 9 p.m.
STUDENT COUNCIL CAMP: Twenty-three members of Lester B. Pearson High School’s Student Council and teacher-advisors started the school year early on August 20 and 21 with their fifth annual Student Council Camp, organized with Dynamix at Les Bosquets Albert Hudon Camp in Otterburn Park. During the two-day leadership camp students challenged their comfort zones and were encouraged to develop as leaders. Some of the challenges that they faced were trusting building activities such as the trust fall, wall climbing and also team challenges that require us to problem solve and work together to overcome obstacles. They capped off this year with Ice Bucket challenges that have gone viral all over the world and within our student council, always striving to inform and make a difference in our community. MULTICULTURAL DATEBOOK: The EMSB has published its Multicultural Datebook online. It can be downloaded to your desktop and printed. This is a booklet version of our wall calendar, which is also online. ST. MONICA BUZZ: Bartimaeus (www.bartimaeusquebec.com) has been supporting children and families throughout Quebec and Ontario since 1988. It provides professional and flexible support in-home, at school and through social service organizations for children, adolescents and adults experiencing mild to extreme behavioural difficulties. Bartimaeus also provides classroom programming, consultation and training. At St. Monica Elementary School in NDG, Bartimaeus has provided extraordinary assistance in terms of activities and comportment on the playground. Here is the link to the full backgrounder from The Bartimaeus Buzz. GARDENVIEW PROGRAM: Through the STUDENT TO STUDENT PROGRAM initiative, the students of Gardenview Elementary School in St. Laurent helped make "back-to-school" easier for children of other EMSB schools by donating basic school supplies. Students Nazario Richard-Yates and Talia Puterman-Salzman, teacher Valerie Nandhra (who initiated the program), Principal Evelyne Alfonsi and Vice-Principal Rea Limperopoulos delivered over 150 beautifully decorated boxes filled with school supplies to students at Coronation, Westmount Park and Parkdale. ALL ABILITIES EXPO: The Quebec Special Needs Association is pleased to announce that it will be hosting the All Abilities Expo, the largest annual gathering of individuals, families, advocates, organizations, and agencies that cater to individuals with special needs and disabilities. It will take place on Sunday, October 19, 2014 at Stade Uniprix (285 Rue Gary-Carter, Montreal) from 10 a.m. to 5 p.m. Admission is free. Attendees will be introduced to cutting-edge products and services for people with a wide range of disabilities, including mobility products, devices for people with developmental disabilities, medical equipment, home accessories, essential services, low-cost daily living aids, products for people with sensory impairments and much more. Local radio host Barry Morgan of CJAD will be the emcee for this fun-filled family event. Activities include two free 30-minute dance workshops hosted by Projet RAD (an inclusive dance program collaborating with the urban dance school) and Luca "Lazylegz" Patuelli, who recently appeared on the Ellen Degeneres Show. MARYMOUNT READS: The third Marymount reads of the Marymount Academy International IB (International Baccalaureate) Program brought author Pete Hautman to theschool on September 22. Hautman is the author of Godless, which won the National Book Award, and many other critically acclaimed books for teens and adults, including Blank Confession, All-In, Rash, No Limit, and Invisible. Mr. Was was nominated for an Edgar Award by the Mystery Writers of America. Each summer Marymount students are given an author’s book to read and at the beginning of the academic year they get to meet that person and ask questions. WIN AND OUTDOOR CLASSROOM: MAJESTA Trees of Knowledge School Competition is back for a fifth year! Imagine winning a $20,000 Outdoor Classroom† for your school! The MAJESTA Trees of Knowledge competition has been bringing outdoor learning spaces and excitement to schools across the country. Do you know someone who would love to hear about this competition? Invite them to participate! Their school could be next to WIN a $20,000 Outdoor Classroom. Give students the opportunity to design their dream Outdoor Classroom. Ten finalists will be cash winners! One will WIN the grand prize, a $20,000 Outdoor Classroom†! See the enormous effect winning an Outdoor Classroom can have on an entire community. Click the button below to watch a video featuring past winners of the MAJESTA Trees of Knowledge Competition. http://www.majestatreesofknowledge.ca. CENTAUR FOR SCHOOLS: Centaur Theatre Company is proud to present its Theatre of Tomorrow (TOT) Program (http://www.centaurtheatre.com/highschools.php) for the 2014-2015 season. The TOT program makes live English theatre accessible to high school students at a discounted price. Further program benefits include a teacher’s guide providing background information, discussion topics and iprovisation activities; talkback sessions are provided following the performances where students meet the cast, voice their comments and ask questions. Here is the official letter. For more information or to book a group please email groups@centaurtheatre.com or call 514-288-1229 ext 245. Visit their website for a list of dates at http://www.centaurtheatre.com/highschools.php The TOT Program is supported by Great West Life, London Life, and Canada Life. For details email Vanessa Rigaux at groups@centaurtheatre.com. CAREER FAIR: The 15th annual English Montreal School Board (EMSB) Career Fair will take place October 29 and 30 at St. Pius X Career Centre in Ahuntsic (9955 Papineau) for more than 3,000 Secondary IV astudents. Jack Dym of Pipe and Piling Supplies Ltd. and RBC Royal Bank are the event’s title sponsors. Among the special guests will be RBC sponsored Para-Olympic para-cycling competitor Marie-Claude Molnare. Her bio is here. Several on air personalities from 92.5 The Beat FM will also be on hand to talk to students about careers in broadcasting. From 6 p.m. to 8 p.m. on October 29, the Career Fair will be open to the community-at-large. Organizers note that this is a good opportunity for parents to attend with their children as they look towards post-secondary education options. Harriet Cohen from EMSB Adult Education and Vocational Services is the Career Fair chairperson. The Student Services and AEVS Departments of the EMSB coordinate this program. Ms. Cohen notes that the main objective of the Career Fair is to provide students with an in-depth exposure to the various educational opportunities available to them. All students will take part in a brief general information session in the St. Pius X auditorium. Students will then have the chance to visit the various exhibition/information booths staffed by representatives from English vocational centres, CEGEPS, universities, McDonald’s, Air Canada, Yeh! Yogurt and Cafe and some private business colleges. LOVE BENEFIT: Leave Out Violence (LOVE), which operates in a number of EMSB schools, will hold a fundraising event on Thursday, October 23 at TOHU (2345 Jarry Est) featuring Les 7 doigts de la main. With their latest creation, “Cuisine et confessions”, Les 7 Doigts de la Main give birth to an innovative show. Enjoy the gourmet food tour in a casual but stylish setting, enriched by the contributions of chefs from restaurants across Montreal. The kiosks will offer a variety of tapas-style dishes and keep our guests coming back for more. This year our gourmet tour will feature some of the city’s most renowned restaurants such as L’Orignal and Machiavelli’s, to name a few. There is a cocktail Dînatoire at 6 p.m. followed by the show at 8 p.m. Here is the link for tickets. Tracy Mangal and Al Finlayson. COMICCON: Montreal Comiccon is a pop-culture fan convention that showcases artists and products from entertainment genres like Sci-fi, Horror, Anime, Gaming in all its forms, and, of course, comic books. There were many EMSB staff persons and students spotted among the crowds at the Palais des congrès recently. EMSB Pedagogical consultant Tracy Mangal and FACE School teacher Al Finlayson (right) were among those enjoying the show. TEAM HELP EMRU HEAL SOMEONE: Retired EMSB Principal Beverly Townsend is spearheading Team Help Emru Heal, a charity in the memory of her late son Emru who lost his life to leukemia in 2009. The upcoming charity art auction, in partnership with a collective of local and international artists and Centre d’Art BBP, will support the Montreal chapter of the Leukemia and Lymphoma Society Canada’s Light the Night initiative. The event is three-fold: A vernissage (by invitation only), kicking off a silent auction on Saturday, September 27; the continuation of the silent auction, open to the public, from Sunday, September 28 to Saturday, October 11; and the reception and live auction on the evening of Saturday, October 11. The art on display at the event will be provided by the Art Collective comprising seven international artists and two local artists. All artists have exhibited worldwide and have organized or participated in previous charity art events. The art on show reflects the various styles and influences of each participant. Featuring prints on canvas and original works by Ingrid Stichler, Jurgen Schmude, Shane Watt, Darko Jamina, Babatunde Folarin and Tessa Maagdenberg. It all takes place at Centre d’art BBP (1831 Sainte-Catherine Street West). Emru was a Montreal writer who chronicled his experiences as a leukemia patient for his friends and family, some of which he made available on his blog. With the help of the media and grassroots initiatives, he also raised awareness of the critical issue of the under representation of ethnic minorities in the public stem cell registry at the local and international level, and the effects on the mortality of patients in these communities. Info: batownsend@gmail.com or (514) 806-7269. ÉLECTIONS SCOLAIRES : Les prochaines élections scolaires auront lieu le 2 novembre 2014. En ce qui concerne la CSEM, le vote portera sur l’élection de la présidence et de 10 commissaires. Vous pouvez consulter les circonscriptions électorales précises ici. Nous encourageons tous les électeurs qui pourraient figurer sur la liste électorale francophone et qui désirent être transférés à la liste électorale anglophone de remplir et de soumettre ce formulaire. Ceci est un appel à nos parents afin qu’ils nous aident à recruter leurs parents, amis et enfants âgés de plus de 18 ans sur la liste électorale anglophone. CTV a diffusé une série d’émissions d’une semaine sur les élections scolaires. La présidente de la CSEM, Angela Mancini, la présidente de la Commission scolaire Lester B. Pearson, Susanne Stein Day et le président de l’Association des commissions scolaires anglophones du Québec, David Daoust, ont été interviewés. LE DÉFI DU SEAU D’EAU GLACÉE : L’année scolaire 2014-2015 a débuté le 2 septembre par l’appui au Défi du seau d’au glacée de la présidente de la CSEM, Angela Mancini et de la vice-présidente Sylvia Lo Bianco à l’école primaire Roslyn. Non seulement Mme Mancini a relevé le Défi à l’école, mais elle a présenté un programme éducatif au sujet du SLA « également appelée maladie de Lou Gehrig ». SLA est une maladie neuromusculaire évolutive qui affecte les cellules nerveuses du cerveau et de la moelle épinière. Les neuromoteurs partent du cerveau à la moelle épinière et de celle-ci aux muscles à travers le corps. Diane Tkalec, porte-parole de la Société SLA du Québec et infirmière par profession, a parlé aux élèves de la maladie qui a emporté son mari il y a de cela sept ans. Les enseignant(e)s sont encouragé(e)s a télécharger le matériel éducatif pour leur classes à http://sla-quebec.ca/support and services.youth.php. Les dons devraient être adressés à http://sla-quebec.ca. Un grand nombre d’écoles ont relevé le Défi du seau d’eau glacée ainsi que le directeur général Robert Stocker. Le centre d’adultes Galileo a recueilli 700 $ pour la cause lorsque la directrice Martina Schiavone a relevé le défi lancé par la vice-présidente et commissaire de Montréal-Nord, Sylvia Lo Bianco. Mme Schiavone a mis au défi ses enseignant(e)s et ses élèves qui ont acheté des billets qui, si ils étaient tirés au sort, leur donnait l’honneur de verser le seau d’eau sur leurs têtes. JOURNÉE SANS SOUCIS : L’école primaire Général Vanier de Saint-Léonard a tenue sa Journée annuelle sans soucis quelques jours avant le début des classes. Cette initiative a été lancée il y a plusieurs années pour faciliter la transition de la maternelle à la « Grande école ». Les nouveaux élèves ont eu droit à une visite de l’école, ont rencontré les enseignant(e)s et goûté à des friandises maison préparées par l’Organisme de participation de parents. Les parents ont aussi eu un aperçu d’une journée typique et, de cette façon, il n’y a plus de soucis pour les élèves et/ou les parents. CÉLÉBRATION À ROYAL VALE : L’école Royal Vale de NDG a célébré le 25e anniversaire de sa renaissance en tant que destination populaire d’immersion française le 8 septembre, à commencer par une assemblée suivie d’une méga fête pour tous les élèves, familles et personnel. L’assemblée a été animée par la personnalité de CJAD et parent de Royal Vale, Dan Laxer, et a débuté par une cérémonie d’inauguration à l’entrée principale, qui a été transmise en direct à 7900 élèves présents dans l’auditorium. Une seconde cérémonie d’inauguration a eu lieu à l’entrée de l’avenue Draper où un groupe d’élèves a dévoilé une nouvelle murale peinte cet été en collaboration avec En Masse Pour Les Masses. Immédiatement après l’assemblée, tous les invités ont été conviés à la cour de l’école pour un barbecue, en sus d’une vaste gamme de nourriture, des jeux gonflables et de la musique. Royal Vale a été établie à l’origine sur l’avenue Clanranald à Snowdon en 1918. Elle a été relogée à l’avenue Dupuis en 1953. En 1988, l’école a pris une nouvelle orientation en tant qu’école d’immersion française avec un accent prononcé sur les mathématiques et les sciences ainsi qu’un programme d’héritage juif. La croissance de l’école a rapidement exigé qu’elle déménage dans ses locaux actuels de l’avenue Somerled en 1993, dans le bâtiment anciennement occupé par l’école secondaire West Hill. En 1997, Royal Vale a adopté son format actuel : la maternelle à la 11e année, en tant qu’école d’immersion française avec un fort accent sur les mathématiques et les sciences. COURSE TERRY FOX : Fidèles à la tradition annuelle, les rues de Westmount ont été envahies par tous les élèves et le personnel de l’école secondaire Westmount pour la troisième marche annuelle Terry Fox. La marche est organisée annuellement par Jeff Kosow et les élèves du programme de leadership de l’école. Le président honoraire de la marche a été Carl Andersen, 77 ans, un ancien élève de l’école secondaire Westmount en 1950-1952. Andersen, qui a perdu sa mère et deux sœurs enlevées par le cancer a recueilli près de 850,000 $ pour la recherche sur le cancer depuis 1982. Au cours de son combat contre cette maladie mortelle, il a couru plus de 100,000 miles. Andersen est prêt à battre ce record en 2014. En sus d’Andersen, Karine Arakelian, une survivante du cancer et directrice adjointe de l’école secondaire Westmount s’est adressée aux élèves. PETIT DÉJEUNER GENERATIONS : La Fondation Generations qui sert des repas chauds à des élèves de nombreuses écoles et qui organise des camps d’été, a tenu son Bagel-0-thon annuel au Café St. Viateur Bagel à NDG le 18 septembre. Le 10 septembre, City Breakfast TV a présenté une émission à partir de l’école secondaire James Lyng de Saint-Henri pour présenter son association avec la Fondation Generations. NOMINATION : Le conseiller pédagogique en histoire de la CSEM, Tino Bordonaro, a été nommé à la Commission de l’éducation en langue anglaise par le Ministre de l’Éducation, du Loisir et du Sport (MELS) Yves Bolduc. La CELA a pour mandat de conseiller le Ministre sur des questions affectant les services éducatifs aux niveaux du primaire, du secondaire, de l’éducation des adultes et de la formation professionnelle. M. Bordonaro a un mandat de trois ans. Catherine Le Maistre, ancienne vice-doyenne de la Facultés des sciences de l’éducation à l’Université McGill préside cette commission. M. Bordonaro a commencé à enseigner les sciences humaines au secondaire en 1995 ainsi qu’à l’Université McGill. Il a assumé son poste actuel à la CSEM en 2010. SPORTS-ÉTUDES ET L’IMPACT : L’école secondaire Lester B. Pearson de Montréal-Nord est très fière de poursuivre son partenariat couronné de succès avec l’Académie Impact de Montréal. Cette année, neuf élèves du programme Sports-Études de l’école iront sur le terrain pour l’Académie. Ils seront présents au Stade Saputo le mercredi 17 septembre pour encourager l’Impact qui affronte les Red Bulls de New York dans le cadre de la Ligue des Champions de CONCACAF. Une journée typique pour les élèves débute avec des cours de 8 h 05 à 12 h 25. Après la pause du déjeuner, les élèves ont des sessions d’entraînement et d’études à l’Académie Impact de 13 h15 à 16 h 30. L’entraînement a lieu au Complexe Sportif Marie-Victorin situé à moins de deux kilomètres de l’école secondaire Lester B. Pearson. Les neuf élèves de l’Académie Impact sont : Benjamin Collins et Sean Rea, secondaire I, Daniel Pacella et Tristan Resendes, secondaire III, Tristano Fasulo, Luca Piccioli et Marco Pinna Cavallini, secondaire IV, Steven Alberici et Jackson Pickard, secondaire V.
En tant que seule école de la CSEM à offrir le programme Sports-Études et d’être partenaire de l’Académie Montréal Impact, Lester B. Pearson place un accent égal sur la poursuite des études et la passion athlétique. Pour plus d’informations au sujet du programme Sports-Études, Lester B. Pearson organise une soirée Portes Ouvertes le 7 octobre de 19 h à 21 h.
CAMP DU CONSEIL D’ÉLÈVES : Vingt-trois membres du Conseil d’élèves de l’école secondaire Lester B. Pearson et des enseignants-conseillers ont commencé l’année scolaire les 20 et 21 août par leur cinquième Camp du conseil d’élèves annuel, organisé avec Dynamix au camp Albert Hudon des Bosquets à Otterburn Park. Durant le camp de leadership de deux jours, les élèves ont mis au défi leurs zones de confort et ont été encouragés à se développer en tant que leaders. Quelques uns des défis qu’ils ont eu à affronter incluaient des activités de développement de confiance, telles que la chute de confiance, l’escalade de mur et aussi des défis d’équipes qui exigeaient des solutions de problèmes et de la collaboration pour surmonter des obstacles. Le camp a été clôturé par des défis de seaux d’eau. NOUVELLES DE ST. MONICA : Bartimaeus (www.bartimaeusquebe.com) soutient des enfants et des familles à travers le Québec et l’Ontario depuis 1988. Il offre un appui professionnel et flexible à domicile, à l’école et par le biais d’organisations de services sociaux pour les enfants, adolescents et adultes qui éprouvent des légères à extrêmes difficultés de comportement. Bartimaeus offre aussi des programmations de classes, de la consultation et de la formation. À l’école primaire St. Monica de NDG, Bartimaeus a accordé une aide extraordinaire en termes d’activités et de comportement sur le terrain de jeu. FOIRE DE CARRIÈRES : La 15e Foire annuelle de carrières de la Commission scolaire English-Montréal (CSEM) aura lieu les 29 et 30 octobre au Centre de Carrières St. Pius X (9955 Papineau) à l’intention de plus de 3000 élèves du secondaire IV. Jack Dym de Pipe and Piling Supplies et RBC Banque Royale sont les commanditaires principaux de cet évènement. Quelques athlètes olympiques parrainés par RBC seront invités ainsi que des personnalités de 92.5 The Beat FM qui discuteront avec les élèves de carrières en radiodiffusion. La Foire de carrières sera ouverte au public de 18 h à 20 h. Les organisateurs soulignent que cet évènement est une bonne occasion pour les parents d’y assister avec leurs enfants pour examiner les options d’études post-secondaires. Harriet Cohen des Services de l’éducation des adultes et de la formation professionnelle de la CSEM est la présidente de la Foire. Les Services aux élèves et le SEAFP coordonnent ce programme. Mme Cohen souligne que l’objectif principal de la Foire de carrières est de donner aux élèves une vue d’ensemble en profondeur des diverses occasions éducatives qui leur sont disponibles. Tous les élèves prendront part à une brève session d’information qui aura lieu à l’auditorium de St. Pius X. Les élèves auront ensuite l’occasion de visiter les divers kiosques d’information/exposition dotés de représentants de centres de formation professionnelle anglophones, de CÉGEPs, d’universités, McDonald’s, Air Canada, Yeh ! Yogurt et Café et de quelques collèges privés d’études commerciales. The next Focus will be published on October 29. Submissions should be made to Michael J. Cohen preferably by e-mail (mcohen@emsb.qc.ca) by October 24, 2014.